Le ras-le-bol: people are sick and tired of the financial pressures that are increasingly being loaded onto their lives. “It’s not a matter of the end of the world, it’s the end of the month that counts.” A grassroots quasi-revolutionary uprising is shaking the foundations of the French political establishment, writes John Egan from Paris. 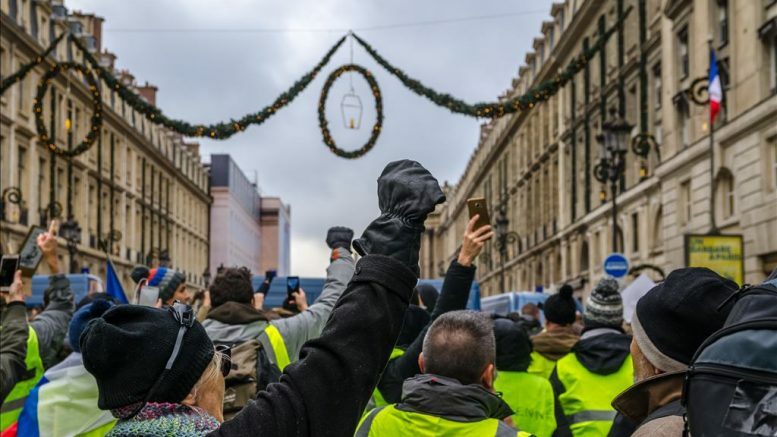 The hi-vis yellow jackets, the gilets jaunes, that drivers in France are legally bound to carry in their cars have become a powerful symbol of discontent. Anger had already crystallised round a plan to increase fuel taxes that the government of President Macron considers necessary to meet France’s obligations to cut carbon emissions to levels agreed in the 2015 Paris COP21 accord. Then a catalogue of disenchantment has emerged that is summarised as le ras-le-bol – people are sick and tired of the financial pressures that are increasingly being loaded onto their lives. The gilets jaunes form a collective expression of individual sentiment. It is flat, structureless, without leadership or even spokespeople, although some reluctant individuals choose pragmatism over ideology to express their opinion. Implicit is a scorching distrust of political leadership of whatever colour. One such pseudo-spokesman, Christophe Chalençon, told LCI TV that the gilets jaunes have moved on from their original demand to cancel the fuel tax. Now Chalençon is demanding the resignation of Macron together with the whole French parliament, “who no longer represent us”. How many of his yellow-jacketed comrades agree is hard to fathom. However, what is known is that the gilets jaunes movement has a high approval rating, at between 42 per cent to 84 per cent of people across France. This support is not only from the just-about-managing sections of society, but is a broad expression of solidarity from people who believe they have a real and pressing grievance. In cars hi-vis jackets have been moved from boot to dashboard as an expression of support. How much of this support will survive the mixing of the gilets jaunes demonstrations over the weekend with extreme right, left and anarchist violence in Paris and other cities remains to be seen. The demands of the gilets jaunes are inherently contradictory: lower taxes and improved services, higher minimum wage and retirement pensions. The already high quality schools and healthcare throughout France are discounted as acquis sociaux – established social rights. Who might pay for it all? There are clues in proposals by some to limit maximum monthly salaries to €15,000 (£13,400) and to reinstate the ISF wealth tax. The tactic of blocking access to shopping centres is reasonably well tolerated by shoppers, but less so by store owners and their employees, who see the Christmas trade that they rely upon to survive the rest of the year fall typically by 30 per cent. A commensurate rise in online commerce in France points to who will win from the disruption. The hopes to reinvigorate rural communities and commerce will be sacrificed to boost the income of the internet giants whose failure to pay tax is often cited by the gilets jaunes as emblematic of their failing society. Contradictions and controversies abound. As the 8,000 gilets jaunes demonstrated, and some ransacked shops and the Arc de Triomphe, the most republican of all national monuments, elsewhere in Paris many thousands of supporters of the CGT union marched peacefully in opposition to the prevailing high levels of unemployment. It replayed events of the week before when 30,000 marched through Paris in an impressive and passionate demand for an end to sexual violence that was largely ignored by mainstream media engrossed in the violent encounters elsewhere. The need to make it to the end of the month essentially demands short-term solutions that conflict with the longer periods needed for Emmanuel Macron’s economic reforms to have a chance to work. The distance between action and outcome on climate change is even longer and arguably even more vital. For the headless gilets jaunes there is no shortage of opinion to feed national debate as the Parisian café-philosophers and bars are alive with discussion. Jean-Jacques offers his view: “In France, we are supposed to believe in Liberty, Equality and Fraternity, but you cannot be free and equal at the same time. … For me, I would settle for Liberty, Fairness and Respect”. It seems that much is at stake as troubled France seeks to modernise its social contract.